The mountains are calling and I must go!! 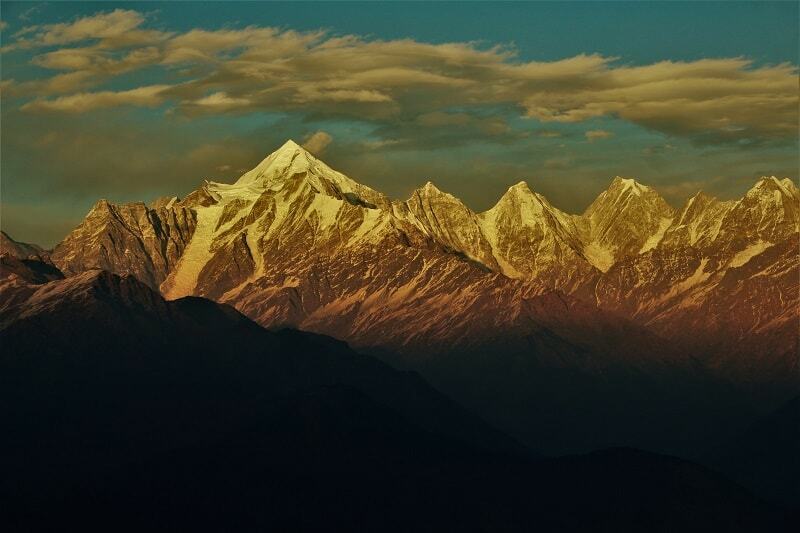 In the recent few years, my adoration to the mountains particularly the Himalayan region has grown colossally. 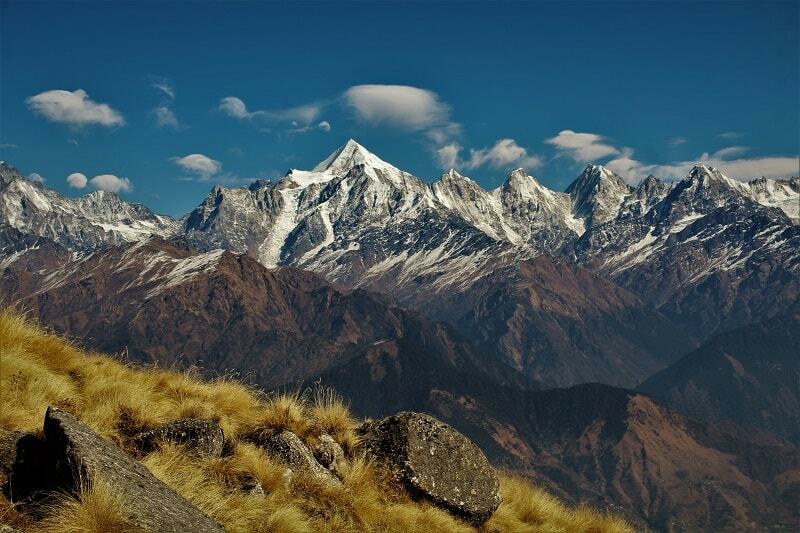 Whenever I return from a Himalayan trek, it feels as if I have left my heart and soul in the Himalayas. 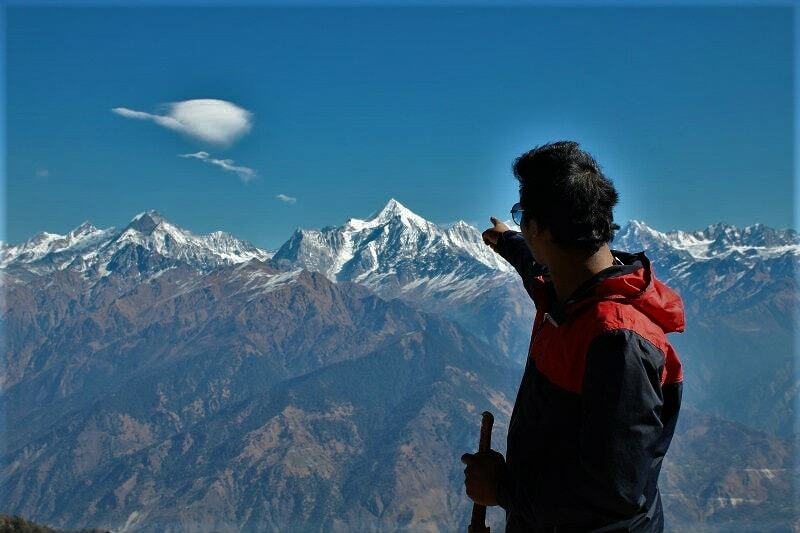 This exactly is what happened on yet another Himalayan Trek – The Khaliya Top Trek. 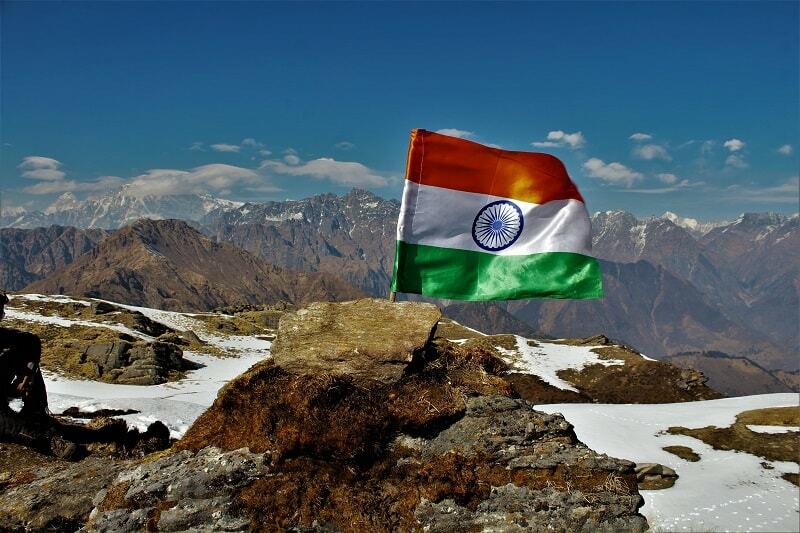 The memories of hoisting the Indian flag at the topmost point are still so fresh!! So where exactly is this Khaliya Top?? 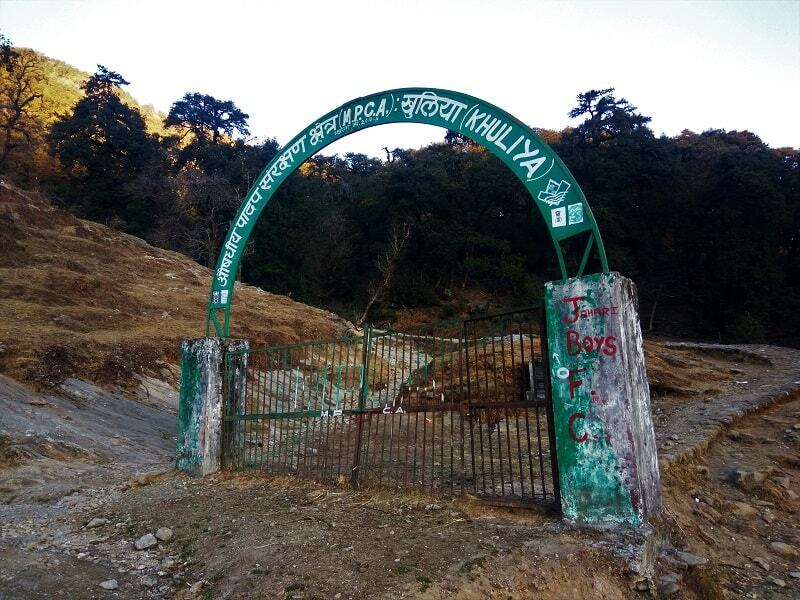 The trek to Khaliya Top starts from Balati Band which is located around 9 kms from the Munsiyari town. The Munsiyari town is situated at the base of The Great Himalayan Range at a height of the around 2200 meters in the Uttarakhand state of India. 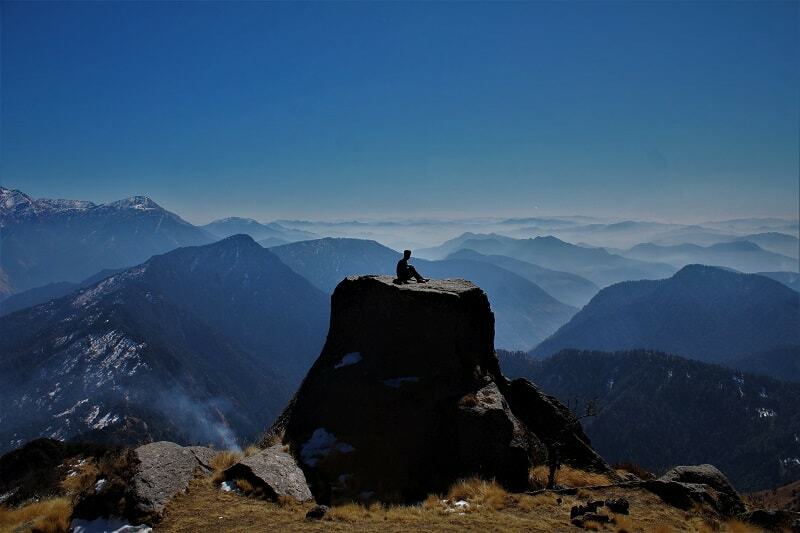 Khaliya top, known to be the highest point in Munsiyari is situated an altitude of around 3500 meters from where one can enjoy spectacular views of the snow-clad Himalayan peaks including Panchachuli, Nanda Devi, Hardeol, Rajrambha and also the Milam valley. But is Khaliya Top really the highest point in Munsiyari? 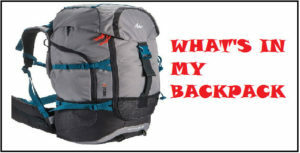 Most trekkers who do this trek return after reaching Khaliya Top. However, there is another point named Zero Point higher up on the same trek about which very few know. 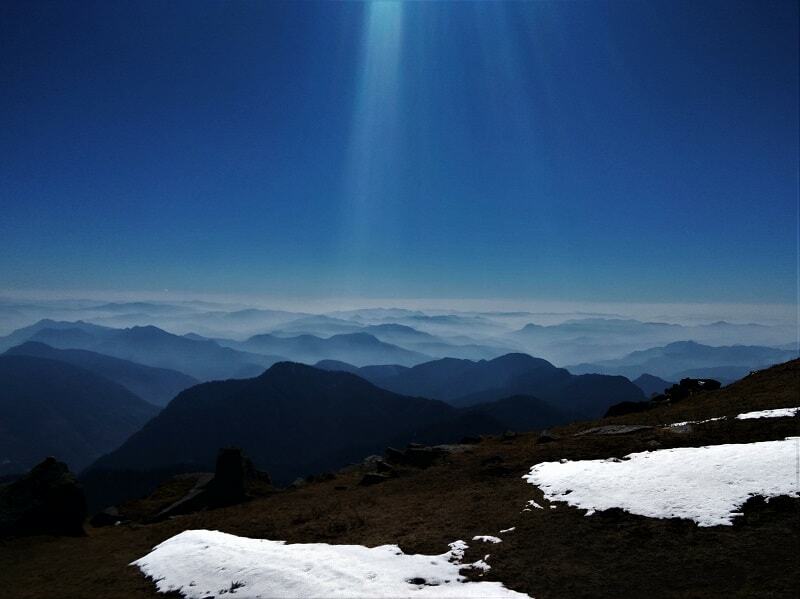 It stands at an altitude of around 4000 meters from where one can enjoy a 360-degree Himalayan view, which isn’t possible from Khaliya Top. Thanks to a local guy who told us about Zero point, where he had hosted Indian Flag on 26th January facing a challenging weather. 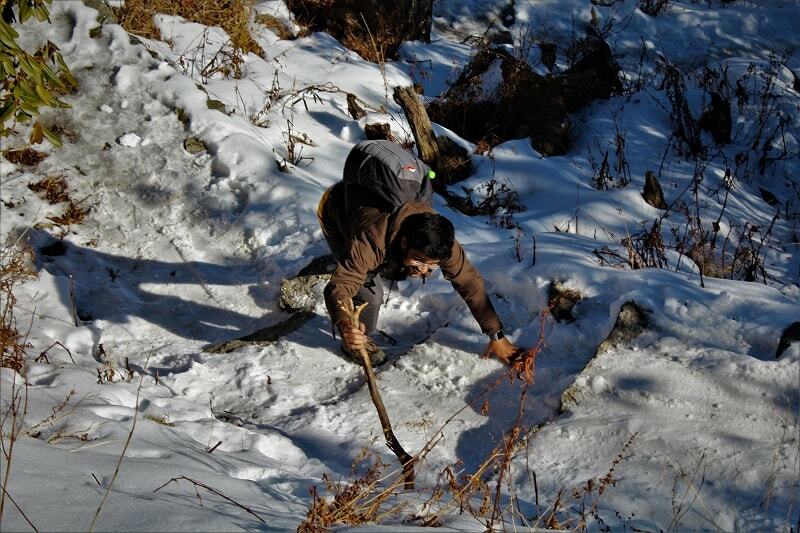 Reaching Munsiyari is a bit challenging task. The nearest railway station to Munsiyari is Haldwani located around 285 kms from the town. Haldwani is well connected to other parts of the country via railways. From Haldwani, there is one direct bus every day (around 5:00 am) for Munsiyari which takes 13-14 hours to complete the journey. If you miss the early bus, you can still reach Munsiyari in break journeys, the way I would ideally suggest you to reach Munsiyari. 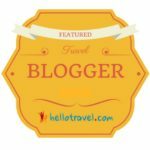 From Haldwani, catch a bus to Almora (90 kms-3 hours – 100 INR), and spend some time exploring the town. Catch a bus from Almora going to Bageshwar (75 kms – 3 hours – 100 INR) on the same day and stay overnight at Bageshwar. 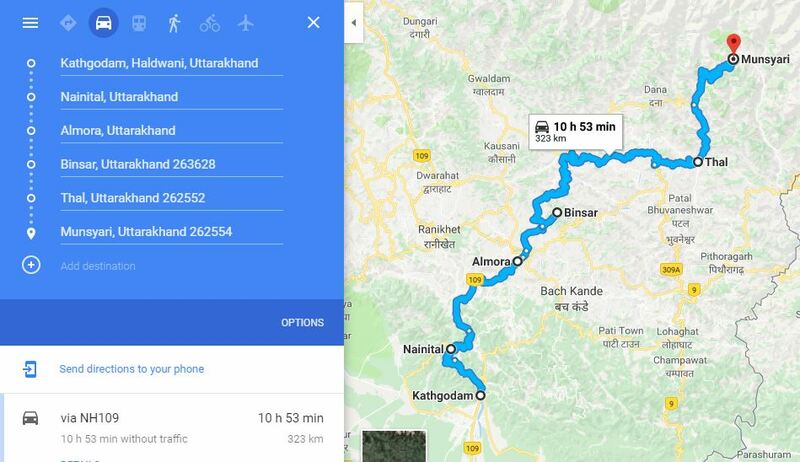 From Bageshwar, you can take an early morning bus (5:00 – 5:30 am) to reach Udiyari (55 kms – 2 hours – 70 INR). Once you reach Udiyari, catch a shared taxi to Thal (20 kms – 50 INR) from where you will get another shared taxi to Munsiyari (70 kms -3 hours -150 INR). The town is small and most points of interest can be explored by walking around. 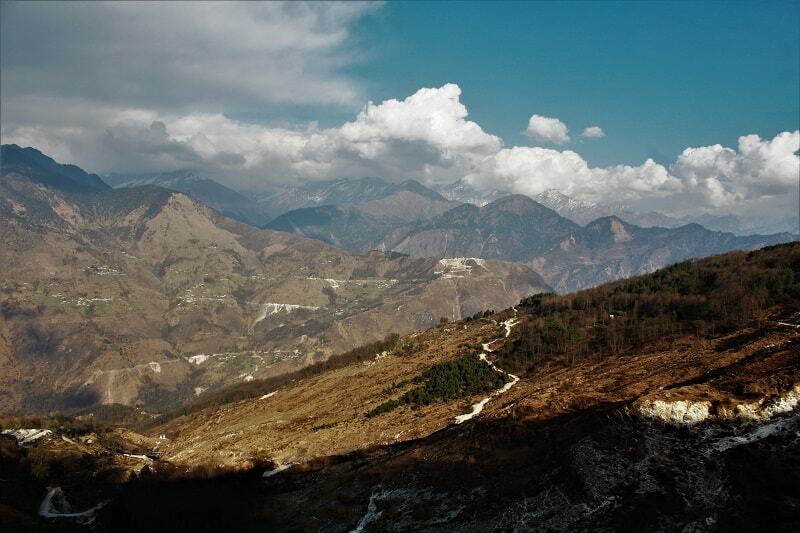 A walk till the Nanda Devi temple from the town center, amidst the snow-capped Himalayan Mountains, is a moment to cheer about. 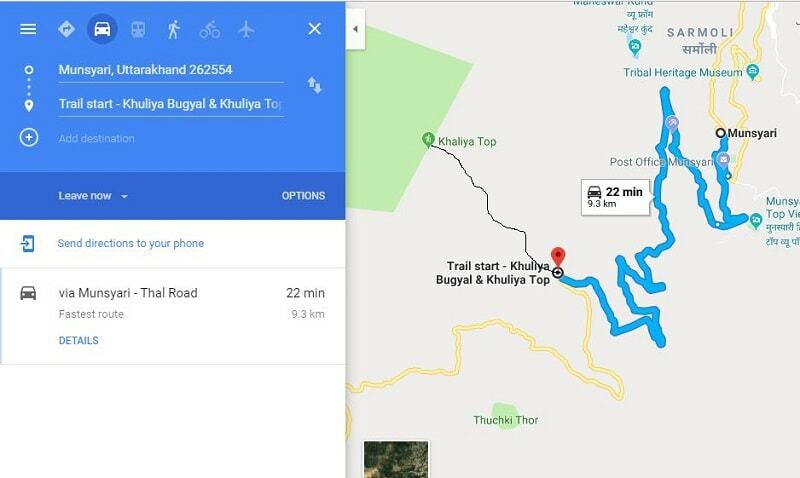 For reaching the Khaliya top trail start point (9 kms from town Centre), you may ask for a lift from a shared taxi which is going towards the same route. If the seats are full, be ready to stand at the back side of Jeep, like we did. After exploring the beautiful town of Almora, next on my list was Munsiyari. I along with my friend Aditya went to the bus stand at Almora and enquired for a bus to Munsiyari. We were informed that there is just one direct bus which had already left. So to reach Munsiyari, either we had to wait for the next day or reach in break journeys and we chose the later. 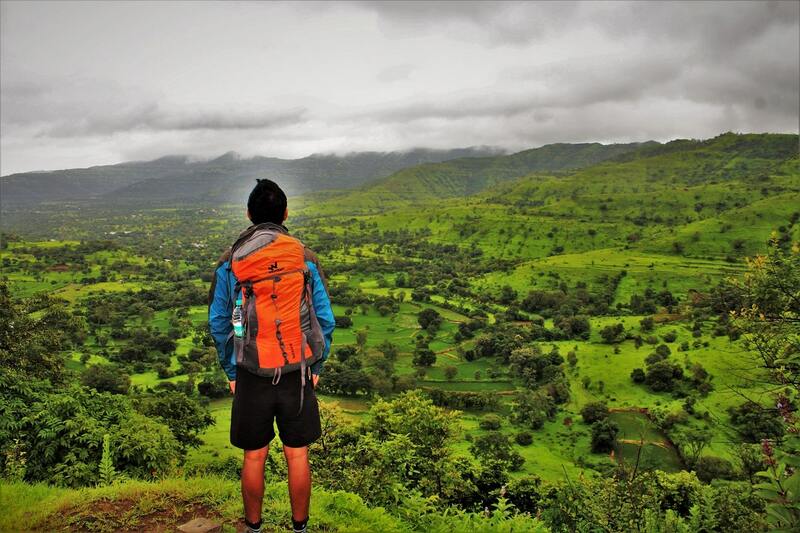 Nowadays, I prefer break journeys over the long ones as they are comparatively less tiring and also gives me an opportunity to explore the small towns and villages’ en-route. From Almora, we had to change transports at Bageshwar, Udiyari, and Thal in order to reach Munsiyari. All these small towns had something that could delight its visitor. It can be the culture, the local food or be the spots of tourist interest. After all the breaks and pit stops, we finally made it to Munsiyari. 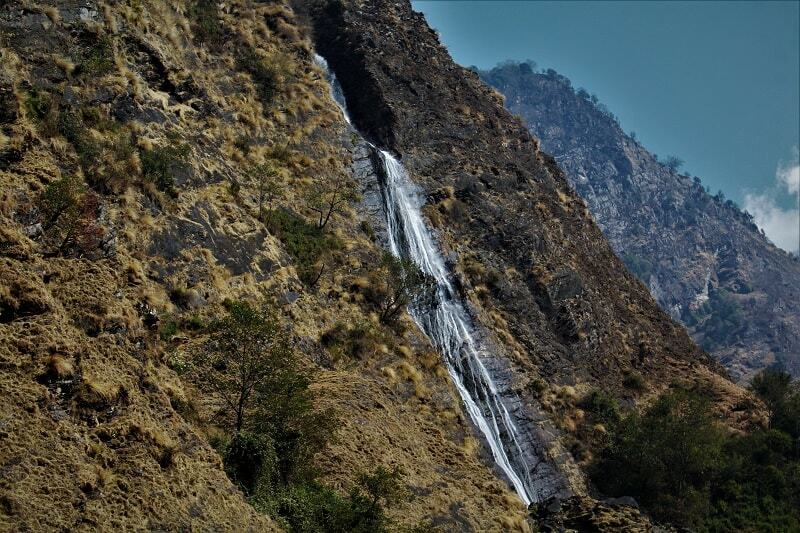 It is the last main town which is well connected to the other parts of Uttarakhand. 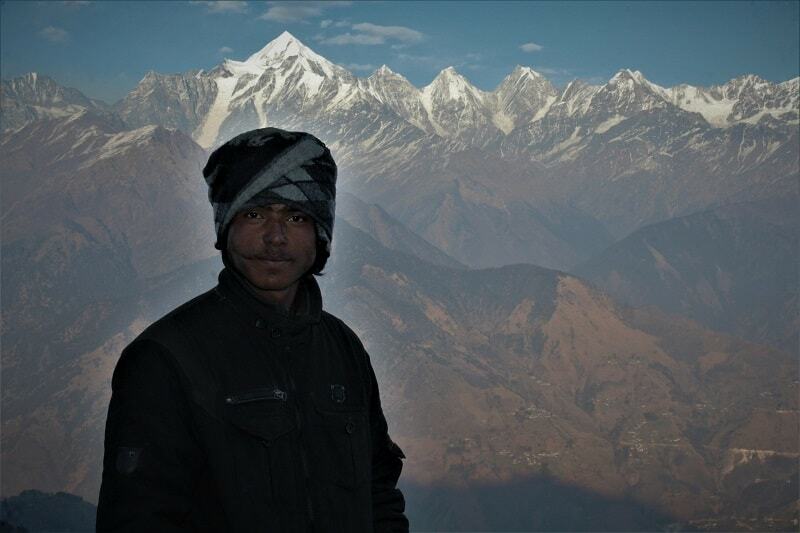 The town offers stunning views of the snow-capped Himalayan ranges especially the Panchachuli peak. 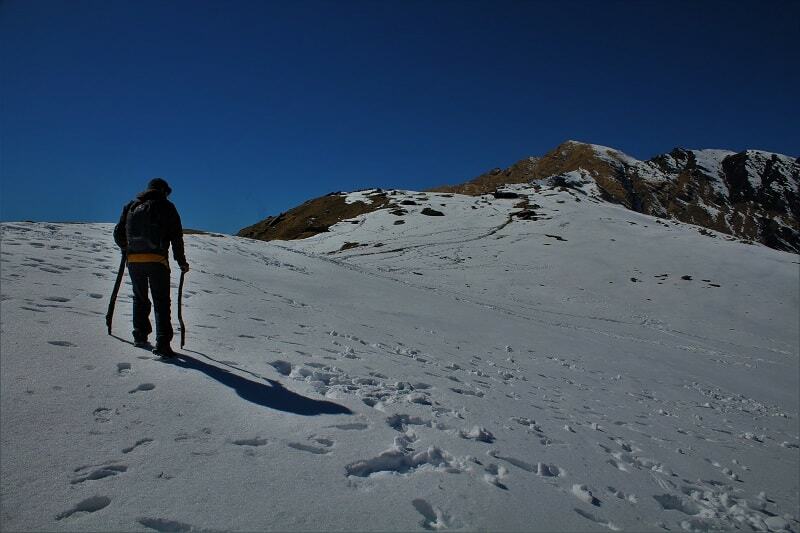 Munsiyari is quite popular among the altitude trekkers who are planning to do long treks like Ralam, Milam, Pindari, Kafni and Namik glacier treks. As we were for a day and a half in Munsiyari, we decided to explore the town for the remaining part of the day and do the Khaliya top trek the next day. A local guy told us to visit the Tribal Museum first, as it was about to be closed in an hour or so. Strolling on the peaceful roads of the town with beautiful surrounding was an adventure in itself. 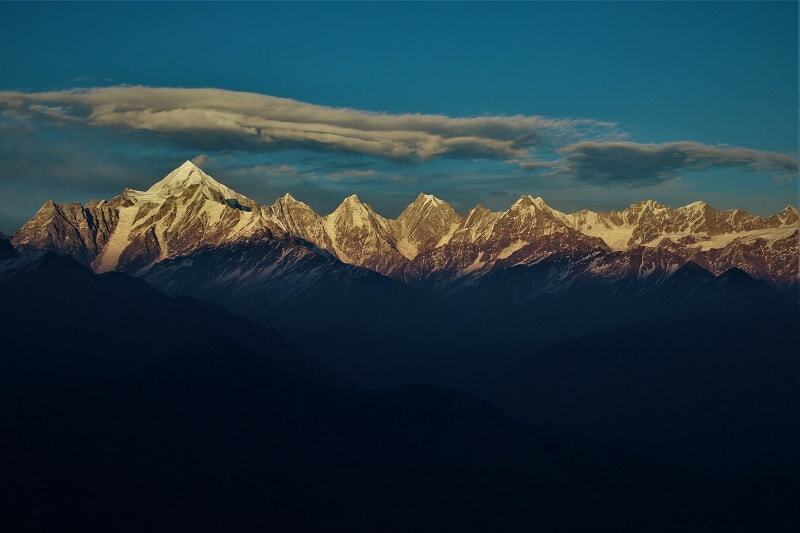 We ended our day with a visit to Nanda Devi Temple crowned by the stunning Himalayan peaks. The next day we started a bit early morning so that we can enjoy the sunrise from somewhere on the Khaliya Top trek. 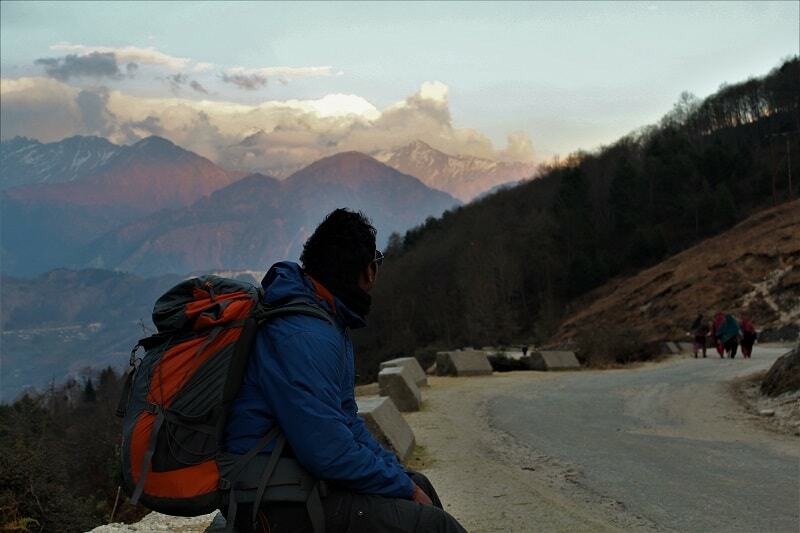 The entire route till the top was simply breathtaking with views of the Great Himalayan Range from every corner. We started around 4:30 am from the hotel. Since the start point (Balati Band) is around 9 kms from the main town, one can use hitchhiking to reach the band. But you need to be lucky to get a lift as taxis passing by are mostly full. We weren’t lucky but we somehow managed to stand at the backside of the taxi, it’s thrilling but risky though. The reason to reach so early to the base was, we wanted to enjoy the sunrise from some point further up the mountain and yes we were blessed with a splendid view of the sun slowly climbing up the mountains. 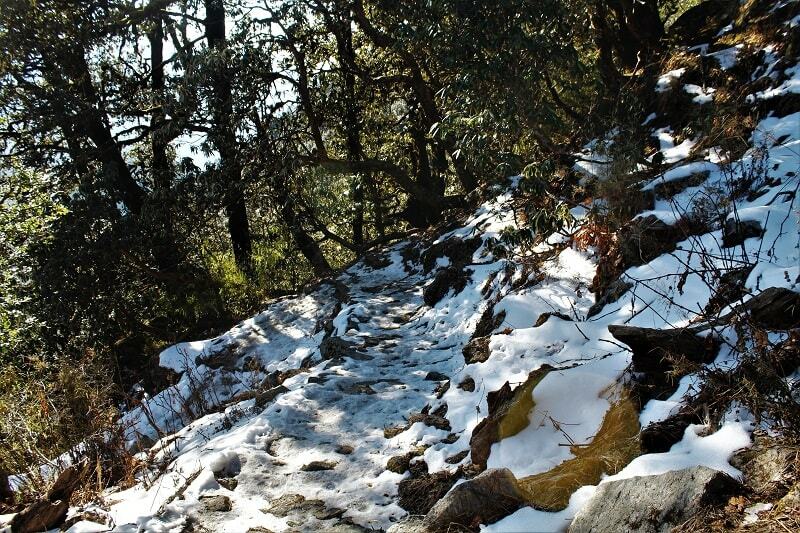 On the initial climb, one can see numerous Rhododendron trees covered with little snow. 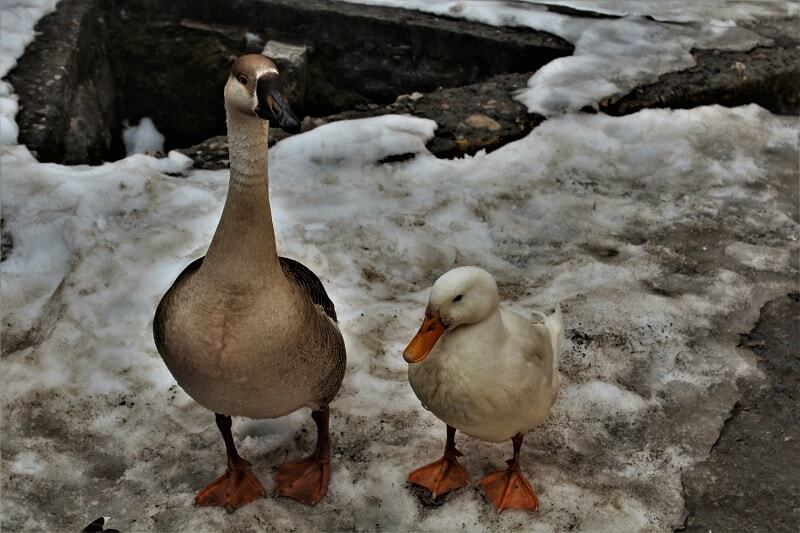 Almost on the halfway, there is privately owned Alpine Resort where you can opt to stay. Eating Maggi and having tea at this resort amidst the huge mountains in the backdrop is a wonderful feeling. 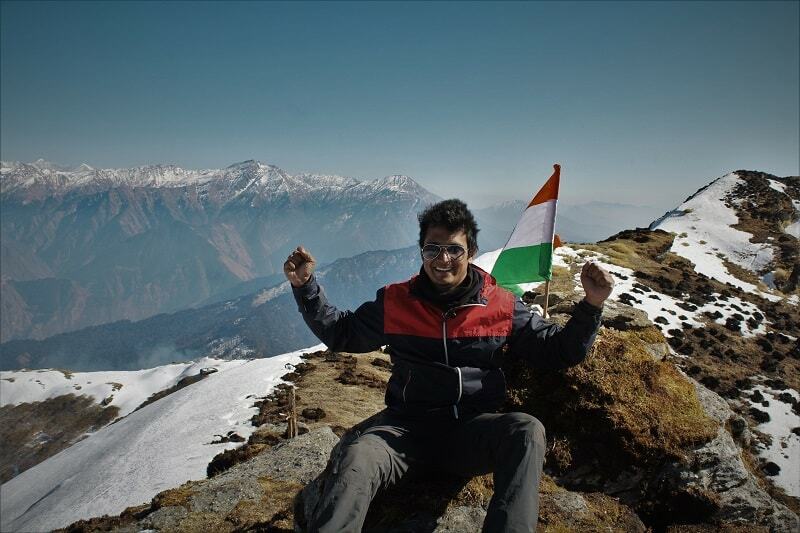 The guy who served us told that there is yet another point higher than the Khaliya top (around 1-hour trek) where he had hosted India flag on 26th January. The moment he told us about that point (Zero point), we decided that we would try our best to go there. The thickness of the snow layer kept on increasing as we were moving higher and higher and the views kept on getting more amazing. The feeling that we were about to experience by waving the flag at the topmost point kept us encouraging to reach the top. After almost a complete uphill climb of two and half hours from the resort, we made it to the Zero point. And, boy what a feeling it was!!! Check the below video. After spending an hour or so at the top, we began with the descent. It was almost 5:00 pm and we could see that the sun had already started setting. 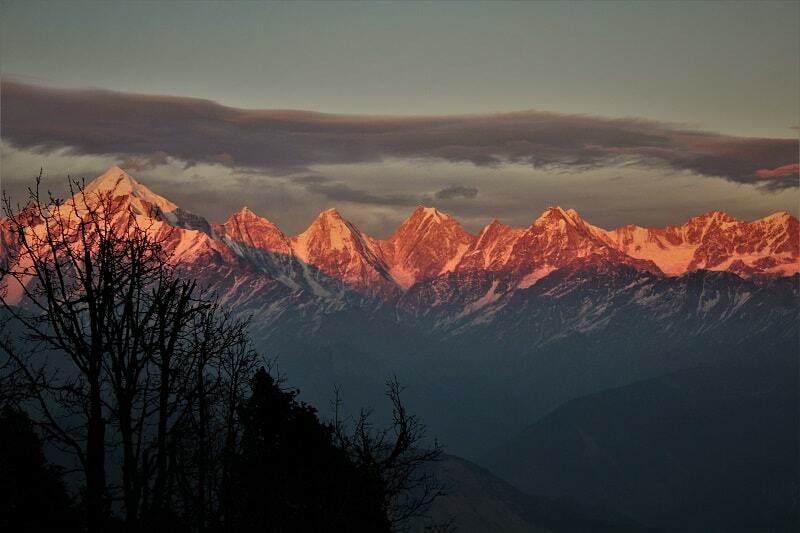 The sunrays falling on the Himalayan range were giving it an orangish color. The views were so breathtaking that we were in no mood to continue with the descent, even knowing the fact that we may end up descending in the dark. We lost the correct trail in the dark and were stranded in the deep jungles. The GPS came to our rescue and somehow we managed to reach the base point of the trek after falling few times in the bushes. From there, we again hitchhiked in the exact same manner we did in the morning to reach the main town. The Khaliya trek top was definitely a lifetime experience for me with so much happening in just a span of a day. 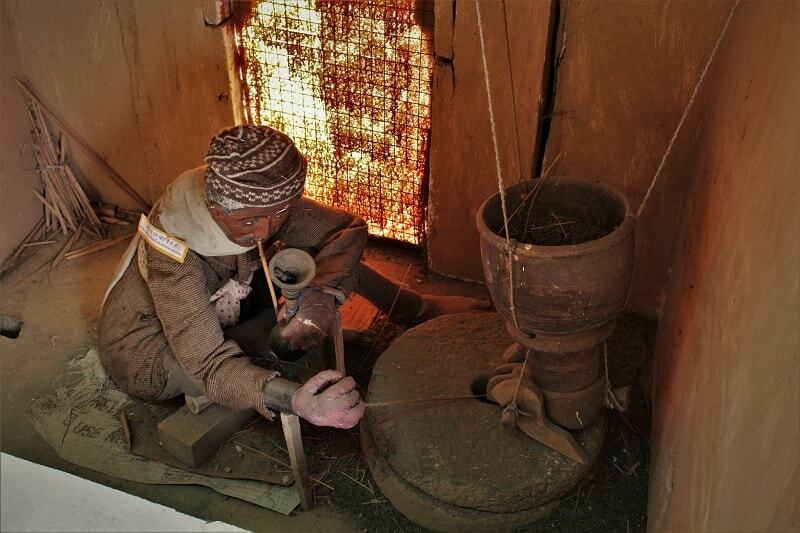 It is a small cultural museum which showcases the culture, history, tradition, and lifestyle of the local tribal communities. An entry fee of INR 10 is needed to be paid at the entrance. A recorded voice is played which assists you while going through the various collections kept here. 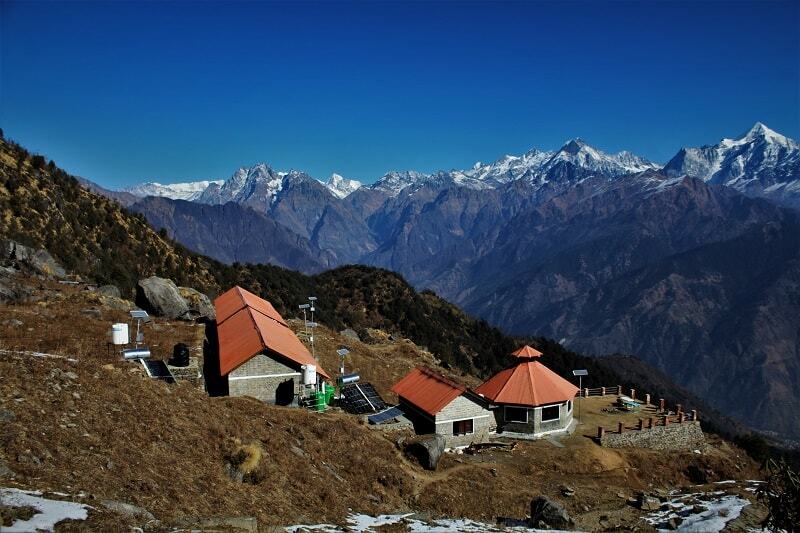 An easy 3 kms trek from the town center will take you to Nanda Devi Temple. The views on the entire route to reach here are just incredible. It is a white temple dedicated to Goddess Nanda. 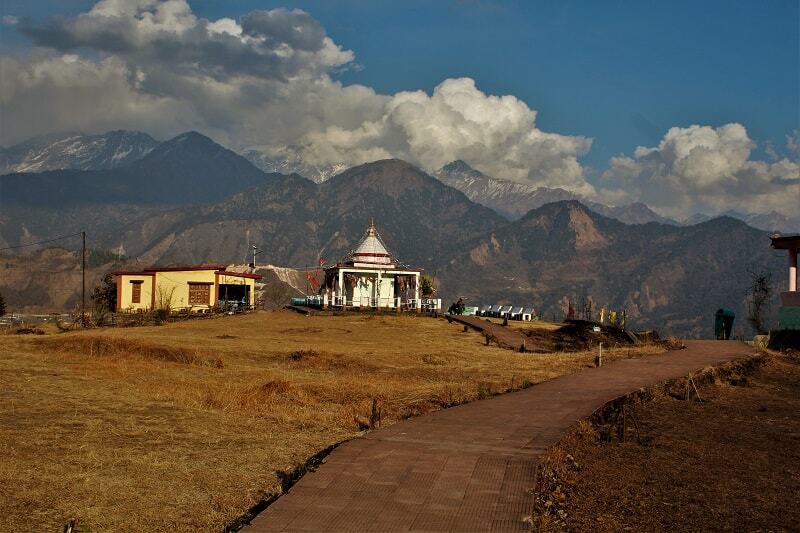 The temple is located in a wide-open meadow which provides a 180-degree view of the Himalayan range. The sunset view from this temple is outstanding. 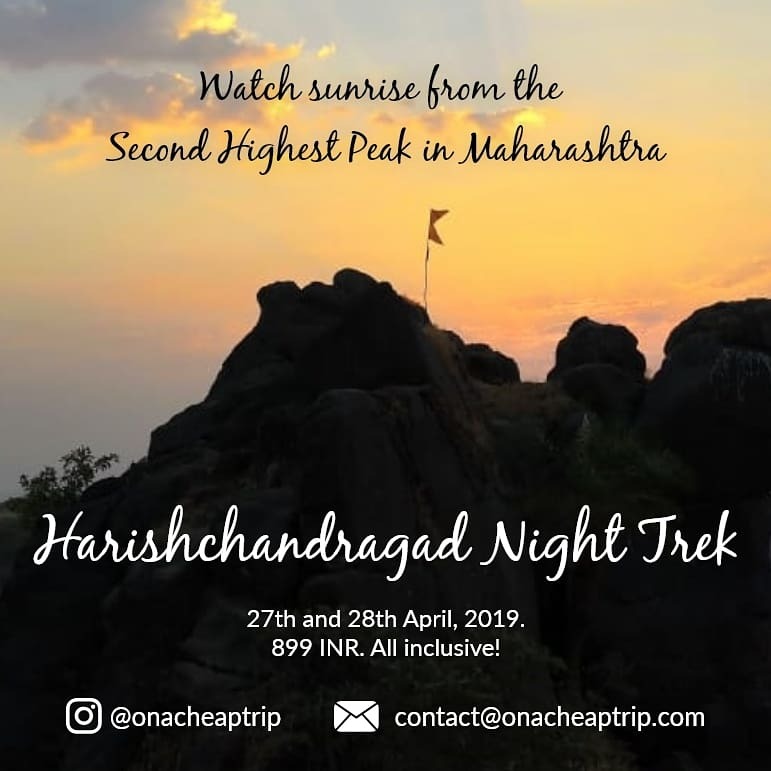 Apart from these places, one can also visit Maheshwari Kund, Balanti Potato Farm, Darkot Village, Thamri Kund, Kalamuni Top, Madkot, and Birthi Falls. As we were short of time, we couldn’t visit these places. There are plenty of hotels located near the bus stand in Munsiyari. I visited the town in the month of February, which was completely an off-season. Almost all the hotels were offering flat 50% discount. We stayed at the Hotel Bala Paradise. Charges for a room/night were INR 700 after almost 60-70% discount. The view of the Himalayan range from the room balcony and the terrace was splendid. You may also find hotels cheaper than this. I am really getting bored while filling out these details. It’s almost the same story for all the places in Uttarakhand. Anyways for my new readers, I should provide these details. 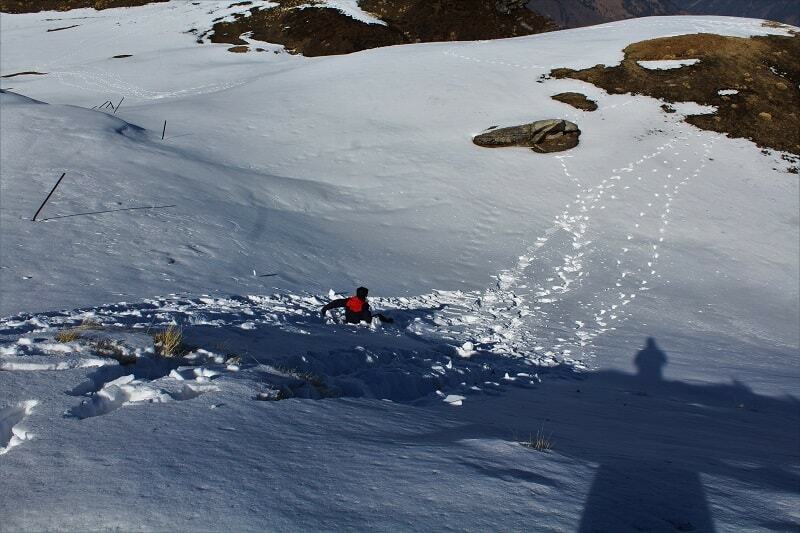 If you want to experience trekking in the snow, plan your trip to Munsiyari in months of December to March. If you are looking to escape scorching heat prevalent in India in months of April to June, a visit to Munsiyari can be a perfect option. I would suggest avoiding monsoon season as chances of landslides are high. I was so engaged in exploring the whole town that I didn’t realize how quickly the time had passed. 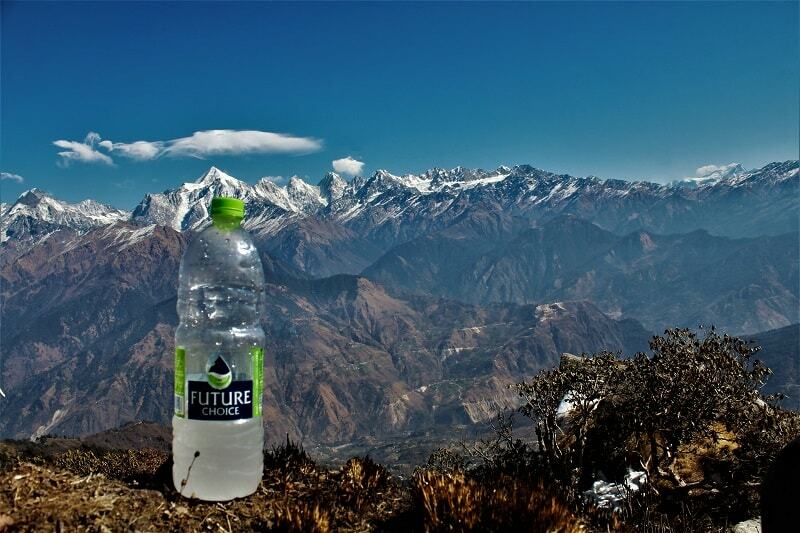 It was time to put an end to yet another Himalayan trek. Thank you Munsiyari for such lovely memories!!! Congrats for your achievement. The pics are great and greater are the views in them. Great Post. Pictures are breath taking. Hopefully one day i ditch all those pricey travel tours and go on my own like you did. Yes you should try…..Thank you so much! !